WASHINGTON -- With the signing of a directive by Army Secretary Mark T. Esper on March 25, U.S. Army Soldiers can voluntarily seek alcohol-related behavioral healthcare without being mandatorily enrolled in a substance abuse treatment program. This policy encourages Soldiers to take personal responsibility and seek help earlier therefore improving readiness by decreasing unnecessary enrollment and deployment limitations. 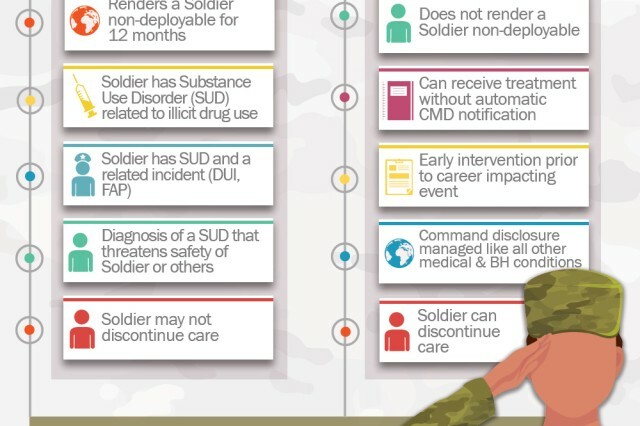 The directive's goal is for Soldiers to receive help for self-identified alcohol-related behavioral health problems before these problems result in mandatory treatment enrollment, deployment restrictions, command notification and negative career impact. "This is a huge historical policy change that will address a long standing barrier to Soldiers engaging in alcohol-related treatment," said Jill M. Londagin, the Army Substance Use Disorder Clinical Care Program Director. "Alcohol is by far the most abused substance in the Army. Approximately 22 percent of Soldiers report problematic alcohol use on Post Deployment Health Reassessments. However, less than two percent receive substance abuse treatment. This is due, in part, because historic Department of Defense and Army substance abuse treatment policies and practices discouraged Soldiers from self-referring for alcohol abuse care." Substance Use Disorder Clinical Care (SUDCC) providers are now co-located with Embedded Behavioral Health (EBH) teams across the Army. "SUDCC providers being integrated into our EBH teams allows for more seamless, holistic, far-forward care than we have ever been able to provide in the past," said Dr. Jamie Moore, Embedded Behavioral Health Clinical Director. The directive creates two tracks for substance abuse care: voluntary and mandatory. 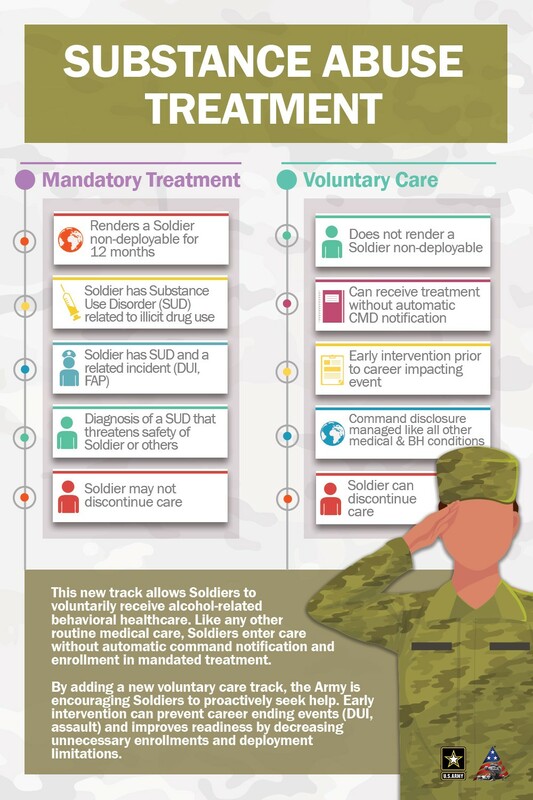 Soldiers can self-refer for voluntary alcohol-related behavioral healthcare, which does not render them non-deployable and doesn't require command notification like the mandatory treatment track does. 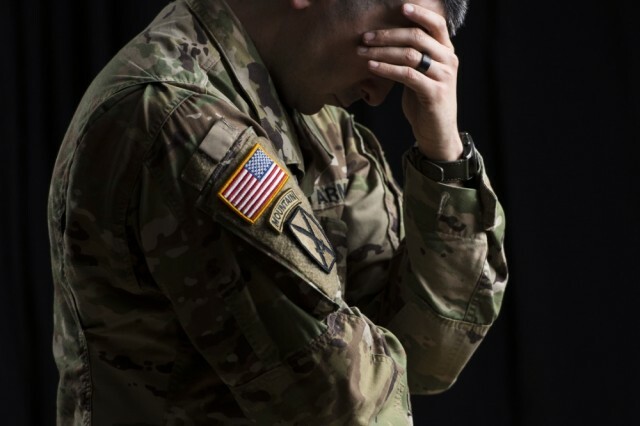 Soldiers enter mandatory substance use disorder treatment if a substance use-related incident occurs, such as a driving under the influence violation. Under the voluntary care track, treatment is not tied to a punitive process and is a choice a Soldier can make before a career impacting event occurs. Soldiers in the voluntary care track may discontinue care at any time and can also choose to reenter care at any time. 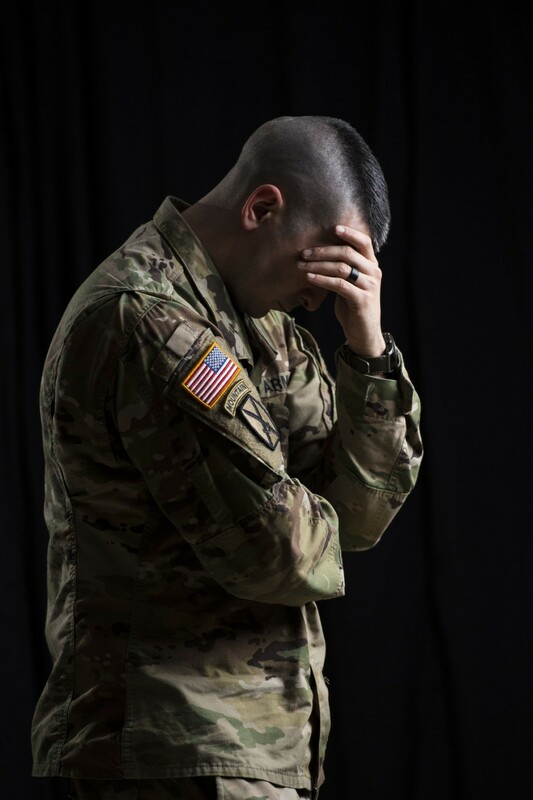 The treatment process begins when a Soldier notices signs of alcohol misuse, which may include frequently drinking in excess, engaging in risky behavior, such as drunk driving, lying about the extent of one's alcohol use, memory impairment or poor decision-making. Next, the Soldier self-refers to Behavioral Health for an evaluation. The provider and the Soldier will then develop a treatment plan directed at the Soldier's goals. The length of treatment will be based on the Soldier and his or her symptoms. HIPPA privacy laws require that Soldiers' BH treatment remains private unless they meet the command notification requirements in DoDI 6490.08, such as harm to self, harm to others, acute medical conditions interfering with duty or inpatient care. "Only those enrolled in mandatory substance abuse treatment are considered to be in a formal treatment program," Londagin said. "Self-referrals that are seen under voluntary care are treated in the same manner as all other behavioral health care." The previous version of the substance abuse treatment policy, Army Regulation 600-85 (reference 1f), required all Soldiers to be formally enrolled in a substance abuse treatment program just to seek assistance, which discouraged Soldiers from seeking help early. "The policy also limited the number of enrollments permitted during a Soldier's career, preventing the Soldier from seeking more support at a later date without risk of administrative separation," Londagin said. "During a pilot phase, 5,892 Soldiers voluntarily received alcohol-related behavioral health care without enrollment in mandatory substance abuse treatment," said Londagin. "This supports our efforts to provide early treatment to Soldiers prior to an alcohol-related incident and has led to a 34 percent reduction in the deployment ineligibility of Soldiers receiving care." "Early intervention for alcohol-related behavioral health care increases the health and readiness of our force and provides a pathway for Soldiers to seek care without career implications," said Londagin.